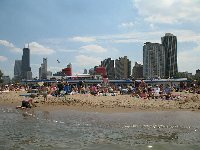 While Chicago is not well-known as a beach holiday destination, its position on the shore of Lake Michigan gives the city access to an extensive network of waterfront recreational areas. There are over 26 miles (42km) of open and free lakefront to enjoy. These include popular spots like Oak Street Beach and North Avenue Beach, the most fashionable places to see and be seen while enjoying the sun of a Chicago summer. The Rogers Park Beaches are also excellent: Howard Beach has a playground for children, while Pratt Beach offers tennis courts and jogging paths. Kathy Osterman Beach (formerly Hollywood Beach) is a great place for beach volleyball and has child-friendly shallow waters at the north end.